Yeah, they are the next big thing. The guys in our lives have their man caves in the basement or garage but, where do us ladies really have our space? It is true that we put our wonderful touches in all of our living spaces (so do our husbands) but, we often don’t have a space that is completely for us to enjoy. When we purchased our home, one of the selling points was the gorgeous shed that was custom-built in our backyard. It’s completely finished but, would need to be drywalled inside. While we have long settled in to our house, Dara has claimed the garage as his space and the den is shared for everyone to enjoy. My office is definitely not the same place where I want to kick back and relax, it’s where I work. So, it occurred to me that we should convert our shed into a she shed. Genius, right? But, if I am going to have a space just for me, it has to be made for me. That means that it needs to be equipped with the latest tech and goodies! Luckily, Best Buy has 6 amazing technology she shed ideas that will rock your socks, check them out–here. Once you’ve built THE perfect she shed with all of the bells and whistles, you want to keep it under lock and key. Secure. That means that the days of leaving a key under the mat are long gone and the days where you can lock and unlock your shed from your phone. You can even send an invite to a friend so they can enter for specific periods of time. The August smart lock works with most standard dead bolts and is easy to install. Ah, gotta love technology! This is just one way to make your she shed incredible. 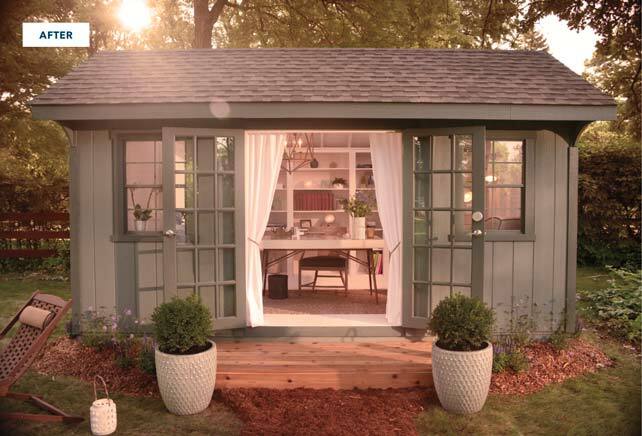 So, turn that old shed into a technological oasis for you to relax in and check out how Best Buy can help you bring it to life. 1. Extend the Wi-Fi for endless entertainment. 2. Set the mood with your phone. 3. Turn ugly cables into art. 4. Bask in the sun (even when it rains). 5. Grant access without a key. 6. 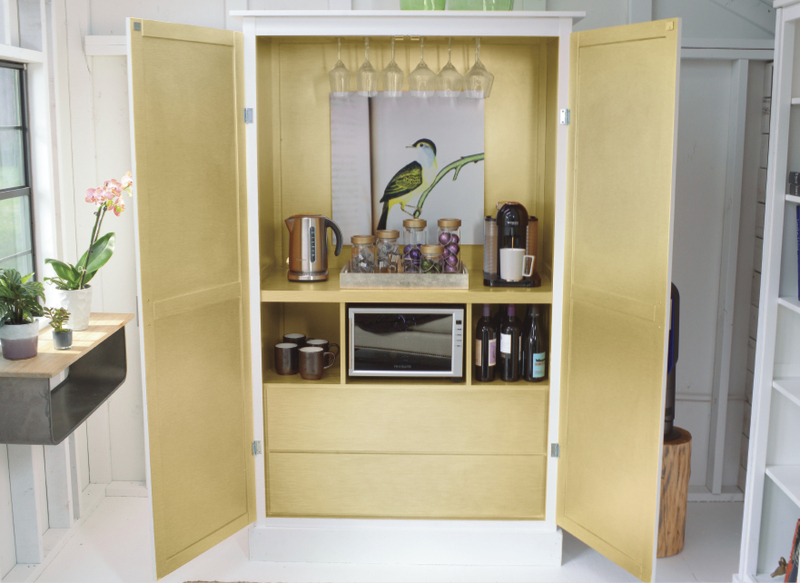 Create a hidden refreshment station. For all the details, visit Best Buy–here. Out of Sight–Not Out of Mind. This is another one of my favorite ideas and something that I am going to incorporate into my own shed very soon. I already have the NETGEAR WiFi extender and I am slowly but, surely making the shed of my dreams. This hidden refreshment station is genius. Having too many small appliances can make things look so cluttered and can take away from the beauty of your shed. Check out which appliances can rock your hidden station’s world and other she shed ideas, here. If you could choose, what would you put in your she shed? That is totally cool, I love it and the idea is getting me thinking but for me a bathroom would be a must, small fridge, microwave, good sound system, comfy couch, huge tv along with a table for projects. That is an awesome idea. I would love a She Shed of my own. I'd put in a nice big TV and Netflix. I'm a season binger! I'd definitely have an are for a foot massager and foot bath. Those are nice. I sure would love to have a she shed in my yard! I bet keeping them secure is tricky. I love the idea of the hidden refreshment stand. Perfect addition to a she shed! I love that it is hidden! I would use my she-shed for a craft room. It is amazing how smart things are getting these days- smart locks baffle me- pretty cool! Haha, me and you both. It really is amazing! Best Buy has some awesome ideas. Having a place for the girls in the house to relax in sounds so nice. I want a she shed!!! Such a cool idea for a lock! The she shed is an amazing idea. I would definitely but in comfy furniture to relax on. I would love to have a She Shed. This looks like a great lock. I like how you can use your phone to lock / unlock. Best part, I love it too. I would want mine to be a reading nook! What a fun idea! My personal space to myself is my kitchen! Having a well-stocked kitchen gives me immeasurable joy! I would love to have a she shed. It would be nice to spend a few hours there everyday where I can read or work on work on my projects without interruptions. The more I look at this, the more I want one so bad! Seriously would be ahhmazing for me to work in and chill! It would be a great place to \”go to work\” to. I have seen some amazing She-Sheds on the internet lately. I would definitely want it to be climate controlled if I had one so I could use it year round! So wacky but, oh so awesome! I want a she shed!! What a wonderful idea to go and have time out and I like the idea about turning ugly cables into art! What a good idea! The most important things in my She Shed would be good light and a warm, cozy place to curl up with a book.